Facebook is quickly becoming the richest available source of real-time crisis reporting. Using CrisisNET we've been monitoring over 2,000 public Facebook pages focused on Middle East conflict since we launched the platform earlier this month. While data from these pages isn't always perfect, it's proven to be an invaluable resource for understanding conflict as it happens on the ground. Traditional, curated reporting data is detailed and precise. Each report captures a single event, and is usually assigned a category, location and structure for use in analysis. Facebook data, on the other hand, is structured for use on Facebook, which is obviously focused on sharing amongst friends, not conflict reporting. Fortunately, using CrisisNET's processing engine, we can augment Facebook content with additional information so it's easier to use in crisis response. 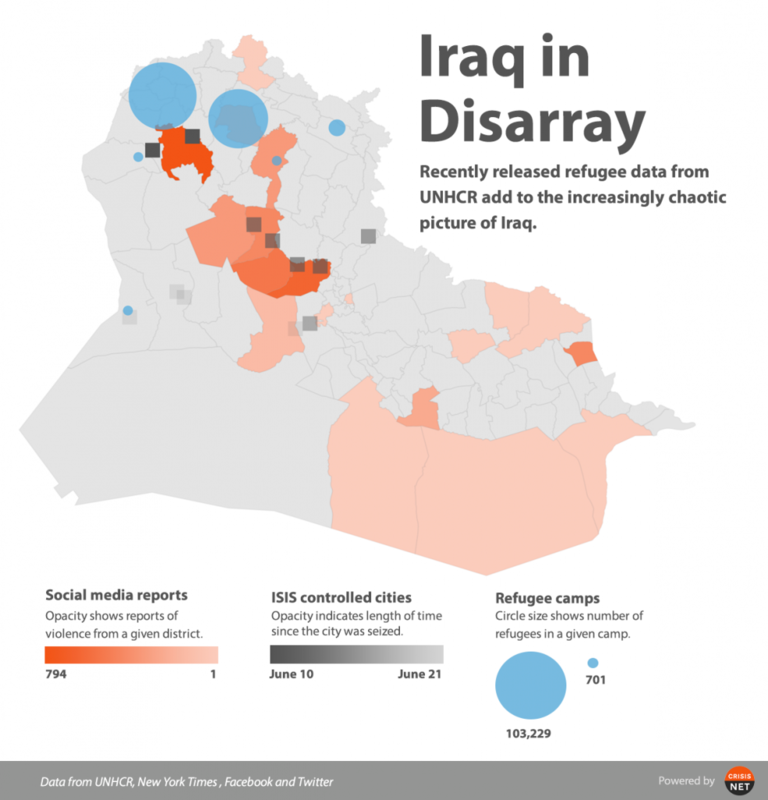 To generate the visualization above (and associated blog post), for example, we used Facebook data that CrisisNET has identified as relevant to conflict. This allows us to count the number of posts about violence from each region in Iraq, and understand the intensity of fighting throughout the country. As you can see from the black squares representing cities seized by ISIS (as reported by the New York Times), Facebook reports accurately show which regions have suffered the most during recent attacks. In addition to mining the text for clues, CrisisNET also understands visual content. Leveraging a technology partnership with AlchemyAPI, the platform now flags photos of people (as opposed to other images like logos, photos of rubble, etc). This allowed us to filter the hundreds of thousands of Facebook posts we collected into a small stream focused that focused on photos of militants we called Faces of ISIS. Using these powerful filters, it's possible to extract real humanitarian intelligence from streaming social media. 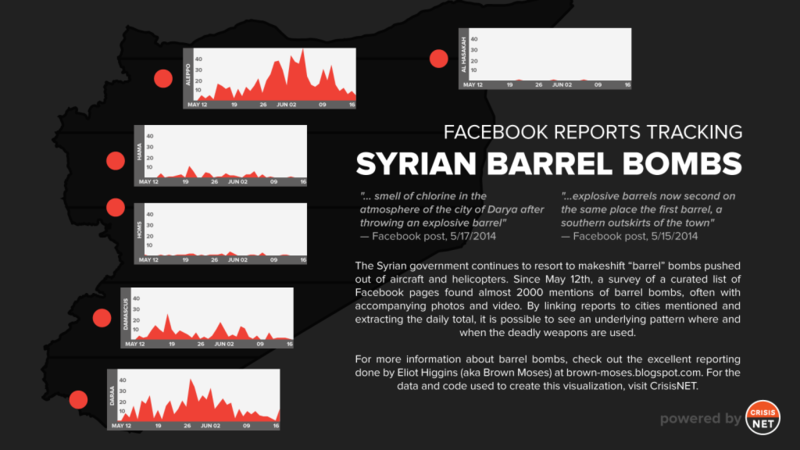 Just last week, using only Facebook data processed by CrisisNET, we were able to show that Syrian chemical weapons attacks are reported most frequently in just three major cities. So where do we go from here? At Ushahidi we've always believed in the power of crowdsourced reporting and open data. Now that Facebook and other social media platforms have emerged as valuable sources of real-time conflict information, it's time to add new streams to the crisis data firehose. For technologists, this means continuing to build tools that extract knowledge from unconventional sources. Activists, humanitarians and non-profit leaders should continue advocating for open data, encouraging governments, NGOs, and for-profits like Facebook to share their data for social good.